Iaso™ Tea ingredients are a special blend of nine safe, natural and edible herbs: Holy Thistle, Persimmon leaves, Malva leaves, Marsh Mallow leaves, Blessed Thistle, Papaya, Ginger, Chamomile, and Myrrh. This blend allows gentle cleansing of the whole body with just 2 cups per day. Modern processing of foods and the pasteurization of dairy products destroys the enzymes that are necessary to our daily diet in order to support a healthy colon. 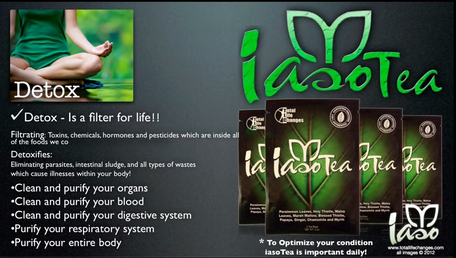 With Iaso™ Tea, we now can get back to enjoying the perfect poop! Iaso Tea like a white tea, a green tea, a weight loss tea, and a great-tasting herbal tea – all wrapped up in a lil’ black pouch. Making the tea is easy. Click here How to Make Iaso Tea. Remarkable things happen when you drink 2 cups of Iaso™ Tea daily. That's 8 ounces twice daily. It’s gentle, yet surprisingly powerful. It is used as a colon cleanse, a parasite cleanse, a Candida cleanse, a blood purifier and a whole body detoxifier. The formula works like a general health tonic and is a home remedy for many conditions listed below. Provides sustainable energy, allowing you to smile more – because life is short, enjoy it. Removes parasites such as worms and flukes from the colon… you may not think, but they do. For over 20 years, just 2 cups of Iaso™ Tea each day has successfully helped tens of thousands of people to cleanse their body of toxins and flush excess waste. Iaso™ Tea is not available in stores or advertised on TV or radio – it can only be bought through Total Life Changes’ Representatives. It is often referred to as a “Miracle Tea” because it addresses troublesome health issues that diminish the joy of daily living. It effectively cleanses your system and by comparison to other diet “fads” is surprisingly affordable. Work with a certified coach to get healthy and lose weight. All online, without going to the gym. What Other Conditions Does the Tea Benefit? Holy Thistle has been used medicinally for more than 2,000 years. A flavonoid in the fruit called Silymarin, is a powerful antioxidant that may also protect the cells of the liver, by removing and blocking the entrance of harmful toxins. Holy Thistle is believed to have great power in the purification and circulation of the blood, and has been used to cure chronic headaches. It is also used for stomach and digestive problems, can strengthen the heart, and is good for the lungs and kidneys. Compounds in Persimmon Leaves have been shown to help remove excess fat from the body. The tannins and flavonoids in Persimmon Leaves are also believed to have anti-hypertensive, anti-carcinogenic, and anti-mutagen properties. Persimmon Leaves have been used to help alleviate digestive problems and dermatitis, and also act as a natural antihistamine, which helps reduce allergic reactions. The Malva, or Chinese Mallow plant, has been used for centuries to soothe the membranes of the digestive system and treat a variety of conditions from stomachaches and gastroenteritis, to irritable bowel syndrome. It can also soothe bronchial irritation in people with bronchitis or emphysema. Marsh Mallow was used by the ancient Greeks to remedy bruises and bleeding, and as a mild laxative. It was used in medieval Europe for indigestion and diarrhea. Rich in calcium, zinc, iron, sodium, iodine, B complex vitamins, and pantothenic acid, Marsh Mallow soothes and supports the stomach, intestines, and respiratory tract. It is also believed to have mild anti-infective and immune-boosting properties. Blessed Thistle has been used in traditional medicine as far back as the early sixteenth century to improve memory, aid digestion, and treat a wide variety of other diseases and disorders. In herbal medicine, Blessed Thistle is used for cancer, infections, inflammation, gallbladder disease, jaundice, liver disorders, cervical dysplasia, heart ailments, skin ulcers, yeast infections, and diarrhea. Rich in antioxidants, B vitamins, magnesium, and fiber, Papaya promotes cardiovascular health and provides protection against colon cancer. Papaya may also help prevent such illnesses as recurrent ear infections, colds, and flu. Papaya also contains the digestive enzyme papain, which is used to treat sports injuries, other causes of trauma, and allergies. Chinese Medicine recommends ginger to treat a number of health problems, including inflammatory joint diseases such as arthritis, gastrointestinal problems, and body aches. Ginger may also ease sore throats, headaches, ulcerative colitis, and fevers and aches caused by colds and flu. Myrrh is used in many countries to treat a variety of mouth and throat irritations. It can be found in some mouthwashes and sore throat medicines, and has been approved in Germany for treating mouth inflammation.